A creature from a planet found far on the other side of Milkyway, found on a planet orbiting a gas giant. Is it because im missing this in the script? No, these are just comments without function. You have the file 'ZendaSys' registered in the wrong place! My next step (if possible) is to export the terrain map and make a city light map above it on own layer to make it look like it got cities. 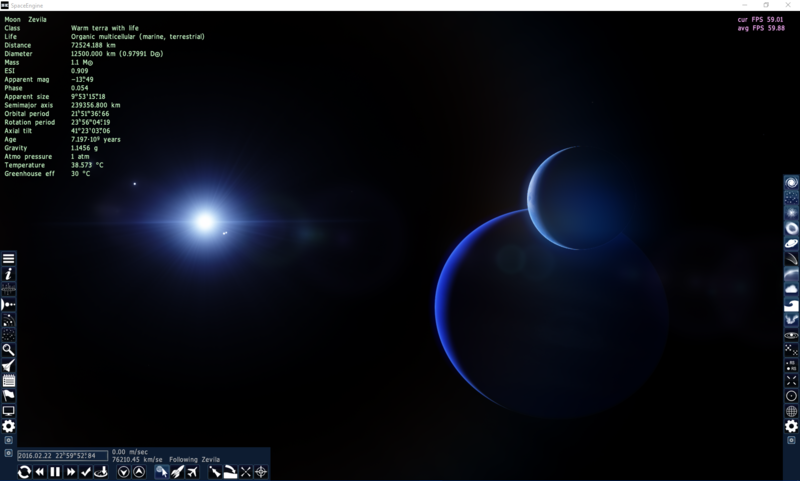 Oh... Also, before adding these two planets i made sure to export the planets that where made procedural to fill the rest of the system. 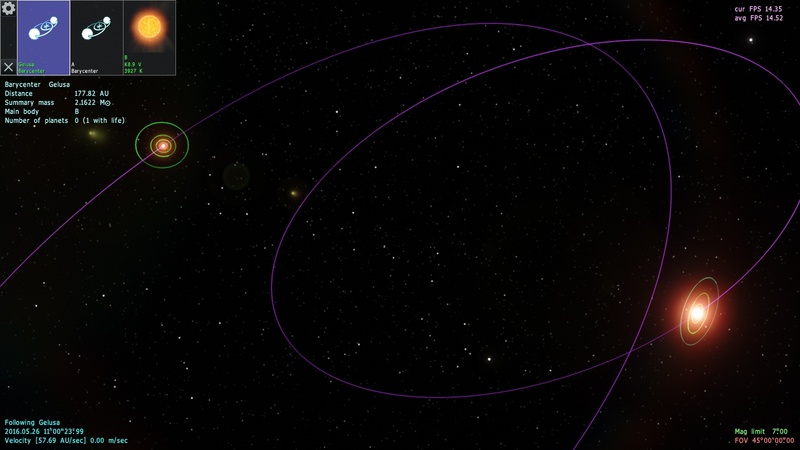 One of the other gas giants appeared on same orbit but i removed that one. And then i'm going to add some more moons to this gas giant i made myself apart from the terra planet orbiting it. Can we make custom textures for accretion disks and if so how ? For some reason my stars are disappearing at distance. The first disappears at just under 4 light years. 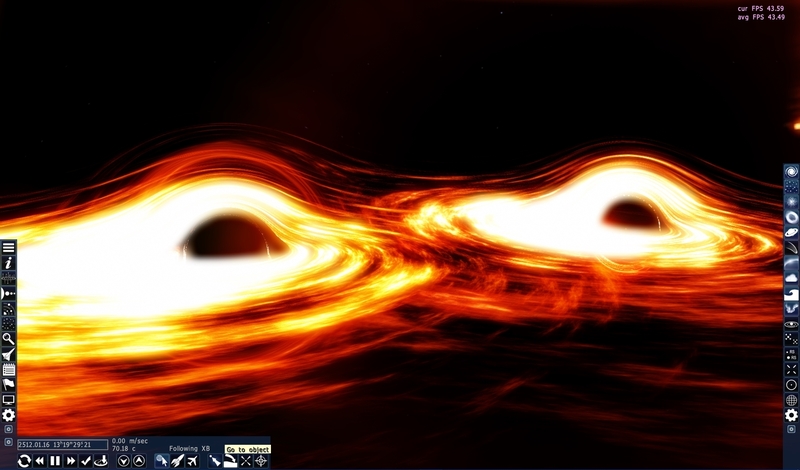 The system's luminosity is also listed in the info sheet at around 86 despite consisting of a black hole and a yellow dwarf of luminosity 0.97. The second star disappears at just over 2,000 AU. For some reason my stars are disappearing at distance. I guess that has something to do with the great distance. If you take only about 4000 parsecs, instead of 4.2 billion parsecs, this does not happen. The calculation accuracy of SE decreases at such great distances. Here 'Ketu' is about 75 light-years away. Did not seem to help. 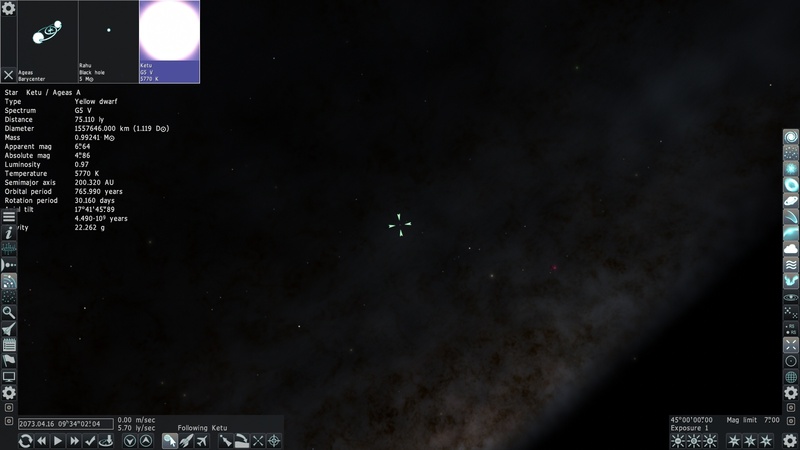 I progressively moved the system until it was only about 6 parsecs away from Sol but it still disappeared. I even deleted the system and re-added it to see if that would fix it, but no dice. There is a way to create a completely customized system ? I mean you put StarBarycenter but every time he put only a star, he is there a way for it to create multiple stars ? You say go to a planets.sc file but it does not generate random planets. 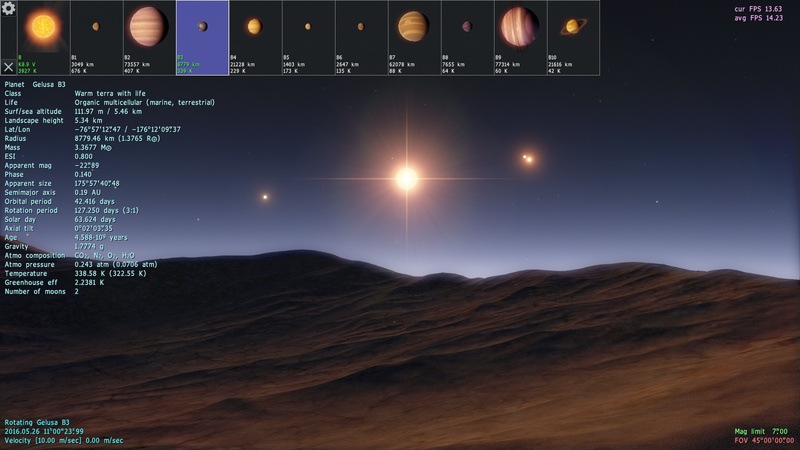 Space Engine then creates multiple star systems for catalog stars. The system may be different with you.